← I have a Dragon, where’s the Selkie? Yesterday I did a post on mythical creatures that would be interesting to see used more often in fantasy. What I had to cut out of the post was the real world animals that I’d also love to see utilized more often in fantasy. So here’s a few animals that would make interesting additions to fantastical landscapes, besides the beloved horse, wolf, dog and mystical feline. I have never seen an ostrich in fantasy, unless you count Swiss Family Robinson, where one of the boys tames an ostrich and rides it in a hilarious race against his brothers. These are fairly fantastic looking creatures to start with. They lay huge eggs and actually give us the phrase “hide your head in the sand”. Anyone want to take a stab at a heroine ostrich herder? Another creature I’ve cannot remember reading in a fantasy book. Perhaps because so many fantasies seem to take place in European style settings. 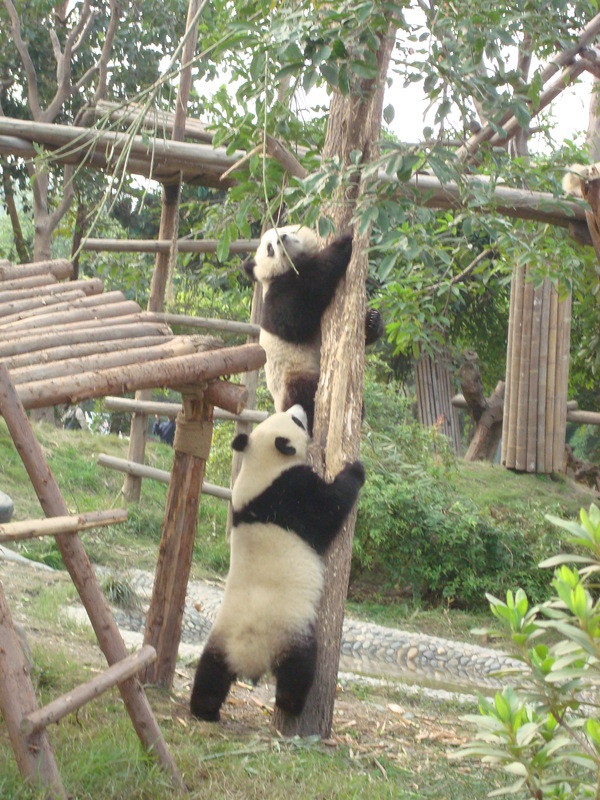 I visited the Panda Reserve in Chengdu, China. These little guys were all over each other. Very cute. Except for animated Kung Fu Panda movie, I’ve can barely remember seeing this creature appearing in any storyline outside of a documentary on China. These are adorable creatures. I’d love to see them appear as pets to a king, possibly or as a talking animal. Anyone seen this done yet? Seriously, these birds can talk, with enough training. They have a certain proven level of intelligence. They can be huge, have personalities, live for extensive periods of time, bond to handlers and can be very dangerous with those claws, beaks and powerful wings. Somewhere, hasn’t someone explored these creatures as part of their fantasy world? You see plenty of cows and goats in fantasy, but almost never bison. These are great, solemn beasts, with good capacity for feeding people and clothing them, as well as providing fuel for fires with their dried dung. Unknown to many people, bison used to range even in the mountains of Tennessee, according to the history books I’ve stumbled a crossed over the years. These birds are scary. They can swallow animals and fish alive and whole and their bill can stretch to contains gallons of water. Check out what’s written about them here. 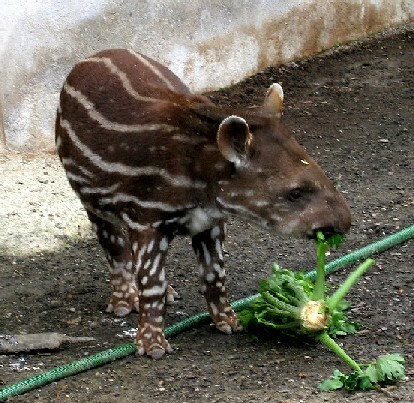 Isn’t this little baby tapir cute? They’re still interesting as adults, but also dangerous, with powerful jaws. These are large pig-like crazing animals with a life cycle of 30-40 years. I find them interesting. However, their life cycle probably precludes them from being domesticated. However, they would add a different sort of texture to a fantastical landscape that’s not often seen. I could go on, and maybe I will in another post, but time to get this out the door for you all! If you have any favorite creatures that you don’t see often in fiction, please leave a comment and share! Thanks. This entry was posted in Creatures, Fantasy and tagged bison, buffalo, pandas, parrot, pelican, Tapir, zebra. Bookmark the permalink. 2 Responses to Does anyone have a Tapir? Pretty please? Isn’t that odd about the buffalo? It’s not as if they’re especially rare or unusual creatures. On the contrary – they’ve been the backbone of many societies, and yet they don’t make it in. It’s like they’re in this gap between “very common – put it in” and “never heard of it – must go in”. I completely agree! Nice way of putting it.